Often when I make dinner I find myself making alternate side dishes because my kids (or husband 😉 ) won’t eat one of the sides I have made. I love my veggies and eat a wide variety of them. The kids (and Aaron) do eat a nice variety (broccoli, green beans, corn, peas, carrots, salad and potoatoes), but not nearly as many different ones as I do. One of my fall favorites is sweet potatoes/yams. In the baked or mashed state, no one will touch these in my house aside from me. Don’t ask me why, they are all crazy. However, I know from buying the Alexia Frozen Sweet Potato Fries, they will eat them in the French Fry form. Hmmm. 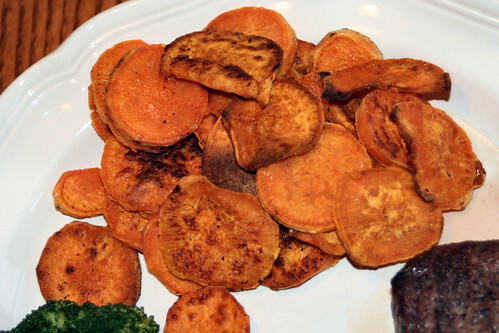 So, for dinner last night I took 3 sweet potatoes/yams (I am not really sure which they were, they taste the same to me) and sliced them into thin rounds and placed on a baking sheet to make “fries”. The kids loved them! I was shocked! I sprinkled them with some cinnammon after baking, so that may have helped. 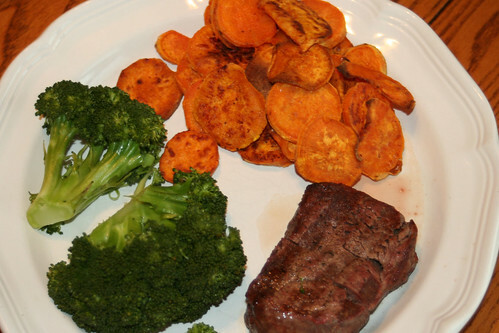 Our meal last night was filet mignon for Jon & I (strips/pieces of beef tenderloin in a pan for Hannah ~ she won’t eat it in steak form), sweet potato “fries” and steamed broccoli. Hannah even asked for seconds of the fries! 1. Scrub & peel sweet potatoes. Slice into thin rounds. 2. Spray baking sheet with Pam. Lay potatoes in a single layer on the pan. Spray the potatoes with Pam. Sprinkle with sea salt & pepper. 3. Place baking sheet into oven (375 or 400; I started at 375 and upped it to 400 half way through). Total baking time is about 30 minutes. I flipped & checked on them every 10 minutes. 4. Sprinkle with cinnamon when they come out. So now I have another side to add to my rotation. I hope they continue to enjoy these. It is really important to me to make sure they get a balanced diet that is full of fruits & veggies and low in fat and processed foods. I have also cut back on foods that contain HFCS (high fructose corn syrup). I would love to say that I have cut it out completely, but there are a few things (Heinz ketchup is the big one) that I can’t (won’t) part with and I believe that in moderation, it won’t hurt us. I have made sure that the bread that I am buying for Hannah & Aaron has no HFCS. Why is it necessary in bread? I mean, come on! The kids do have “treats” after their meals, but only when they put in a good effort and eat their fruits & veggies. Their “treats” and snacks are usually home-baked goodies, Slow-Churned Ice Cream (lower in fat & calories than the full fat versions), fruit, cheese (usually 2% milk varieties), crackers, peanut butter on fruit or veggies, nuts or popcorn. I also make sure to incoroporate whole grains into our meals. This is really important for Jon and I, as GF bread options are not usually rich in whole grains. We eat a lot of whole grain brown rice, whole grain brown rice pasta and I am working on introducing quinoa to the fam. Not sure how that will go over. I may just fib and tell them it is a different kind of brown rice. 🙂 I also bought some flax seed meal to start adding to my home baked goods and foods. Sneaky, sneaky! The menu plan this week is based on some of the family favorites in our house. Sunday ~ Burgers on Chebe Homemade Buns, homemade sweet potato fries (see recipe below), broccoli and okra zuchinni medley (see recipe below). Tuesday ~ Garlic Pork Roast (family favorite), mashed garlic potatoes, steamed broccoli, salad and homemade biscuits (will post recipe later in the week for these with a picture). Thursday ~ BBQ baby back ribs (family favorite), baked potatoes, homemade corn bread (see recipe below) & salad. Friday ~ Homemade pizza (family favorite; dough is Pamela’s Wheat Free or a new one I found from Gluten-Free Mommy that I want to try), steamed veggies and salad. Saturday ~ I am going out for Sushi with my Mom. The kids will have leftovers with Aaron. 1. 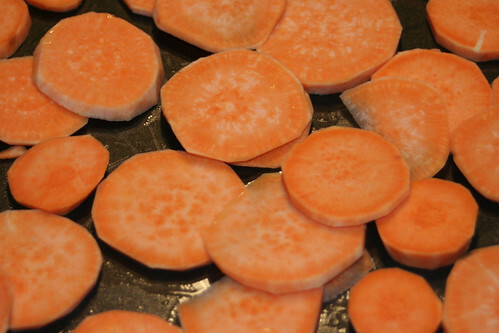 Scrub and slice sweet potato/yam into fry shapes. I left the peel on, you can peel it if you like. 2. Preheat oven to 400 degrees. Pam your baking sheet. 3. 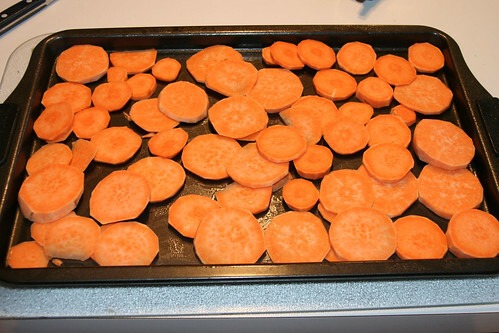 Place potatoes on baking sheet in a single layer. Spray with Pam. Sprinkle with sea salt and lightly with nutmeg. 4. Bake at 400 for 15-20 minutes. Check on fries. Flip them over and bake for another 15 or so minutes. If they aren’t done yet, turn temp up to 425 and keep a close eye on them. If you want to crisp up the outside, broil for the last few minutes. This made enough for 2 people. Cut zucchini in half lengthwise; cut into 1/4-inch-thick slices. Heat a nonstick skillet coated with cooking spray over medium-high heat. Add zucchini, okra, and onion; sauté 4 minutes. Stir in tomato and remaining ingredients. Cover and cook over low heat 5 minutes or until thoroughly heated, stirring frequently. 2 egg whites or 1 egg beaten (I used the beaten egg). Heat oven to 400. Pam 8 or 9 inch baking pan. Combine dry ingredients. Stir in milk, oil and egg, mixing just until dry ingredients are moistened. Pour into pan. Bake 20 to 25 minutes or until golden brown and toothpick comes out clean. (I did 20 minutes). Serve warm. **You can make these into muffins. Bake for 15-20 minutes at 400. Makes 12 muffins. 3. Cut racks of ribs in half (so they all fit, single layers, in the baking dish). 4. Coat both sides with sauce and place in baking dish. Don’t skimp on the sauce. 5. Cover tightly (like twice) with foil. 6. Bake for 2 hours. 7. Let cool slightly on the counter. Either put in fridge or heat up the grill to finish off. 8. About 20 minutes before you want to eat, heat up the grill. 9. Place ribs on grill and brush both sides with sauce. 10. Grill until they start to brown up on both sides. Make sure to check out Cooking & UNcooking for lots more GF Menu Plans. Thanks for hosting! Also, for more menu plans, check out Org Junkie.